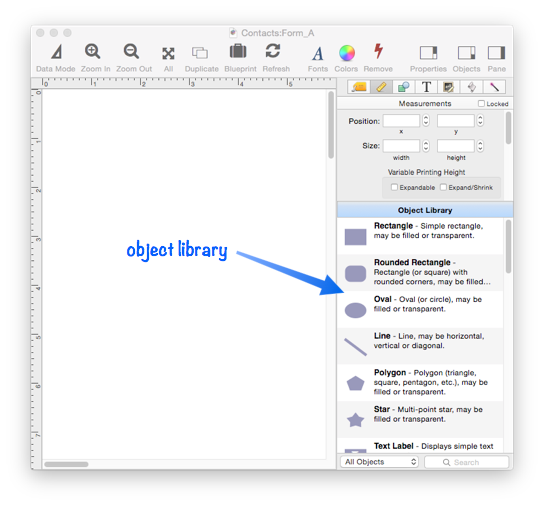 The Object Library is used to create new objects in a form. The library appears in the lower right hand corner of any form window that is in Graphics Mode. The Object Library displays a list of all of the different types of objects that can be included in a form. To add a new object to a form, either 1) Double click on the type of object you want, which creates a new object in the center of the form window, or 2) Drag the type of object you want onto the form, which allows you to position the new object wherever you want. Once the new object is created you can adjust it’s size by dragging on any of the corners or edges, and you can use the Object Inspection Palette to modify the attributes of the new object (color, font, etc.). The Object Library normally displays all of the available object types. You can use the pop-up menu at the bottom of the Object Library to select only a subset of available objects – for example just shapes, or just buttons. Choose All Objects to go back to showing the entire list. You can also display a subset of object types by clicking on the search field at the bottom of the library and then typing in a few characters. For example, if you type in radio you’ll see that radio buttons are created using the Data Button object.